Winning Futures is an award-winning nonprofit organization that helps educators, mentors and adults with goal setting for elementary students. To assist with goal setting for elementary students, the Winning Futures workbooks and training handbooks provide the appropriate structure required to develop positive life skills and map out their future. We accomplish this by providing students with hands-on activities that focus on self-exploration, identifying strengths and talents, appreciating diversity, understanding values and developing positive relationships. 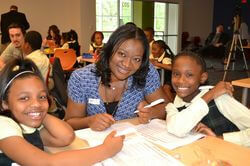 We’ve helped numerous schools and non-profit agencies around the country with goal setting for elementary students. Students who enter our programs see significant improvements in honesty and respect, as well as their study habits and motivation. To learn more about the Winning Futures workbooks and training books that assist with goal setting for elementary students, visit https://winningfutures.org or contact us.